Cymbidiums have always been my favorite variety of orchids. I've been collecting them since I was in college and fell in love with a neighbor's wine barrel full of amazing blooming orchid stalks. Over the years, I have added many plants to our container gardens and have enjoyed spectacular blooms. 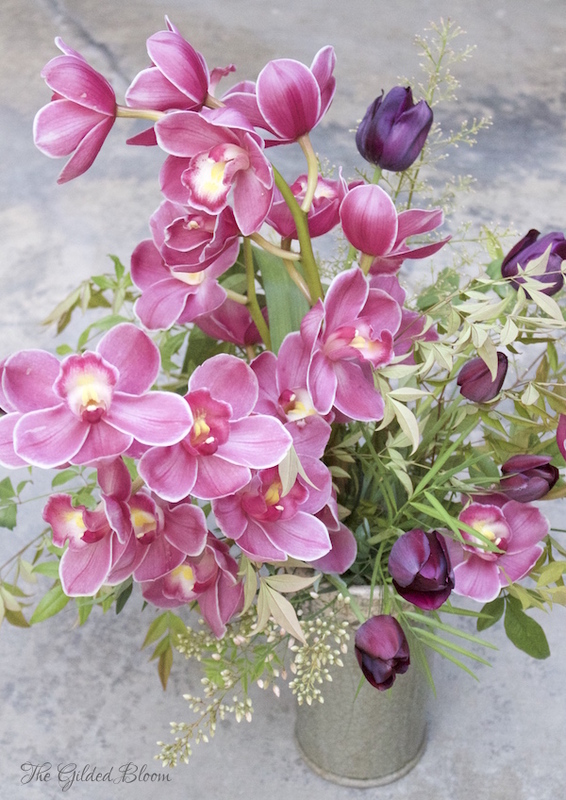 Cymbidium orchids originated in the Himalayas and tolerate unusually cold temperatures. They are found throughout Asia and produce large robust blooms in late winter or early spring. The flower stalks can last 4-6 weeks. 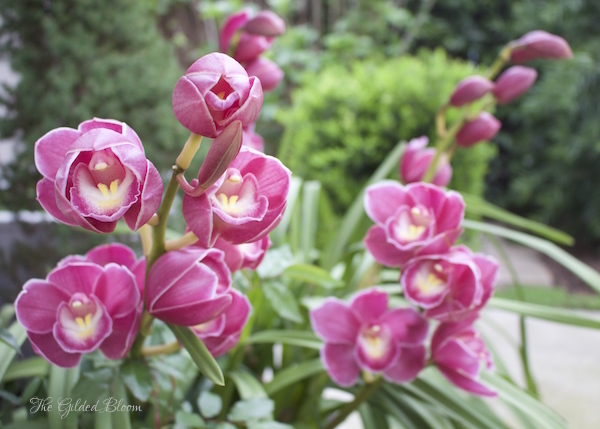 Different orchids in our garden have been in bloom since late January and I cut the pink flowers you see here last night for the arrangement. They should stay alive and beautiful for another few weeks. 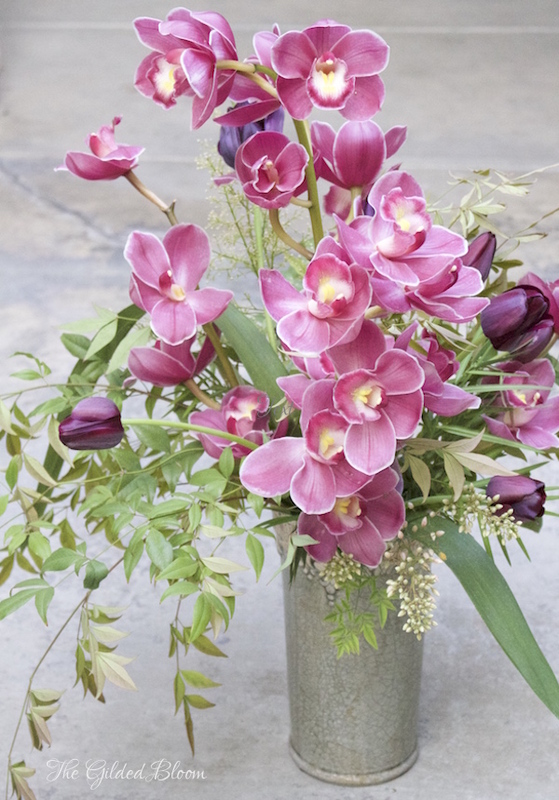 Cymbidium is easy to style but must be handled carefully as the flowers are very fragile. To create this mixed arrangement, I put the stalks of orchids into a tall container and then combined them with sprigs of heavenly bamboo recently pruned from the garden. 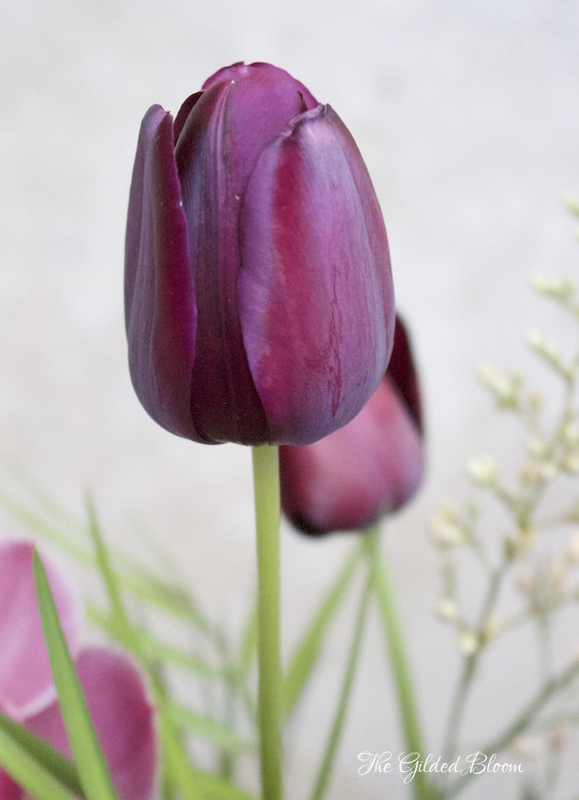 Since our deep purple tulips are currently in bloom, I added a few throughout the design to enhance the color of the orchids. This arrangement is about 2-3 ft tall and makes a stunning centerpiece. I plan to refurbish the blooms in a simpler vase in the weeks to come.